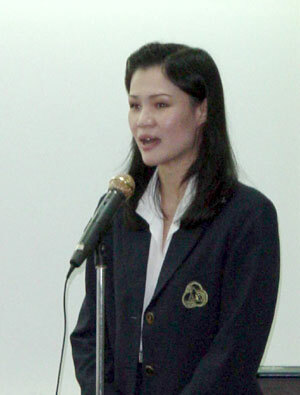 The Computer Club of Chiang Mai and the Kanoksin Export Import Company Limited have been awarding scholarships to needy students with good academic records since the year 2000. The president of Computer Club of Chiang Mai, Rassamee Wesurai gave a short speech and introduced the company. 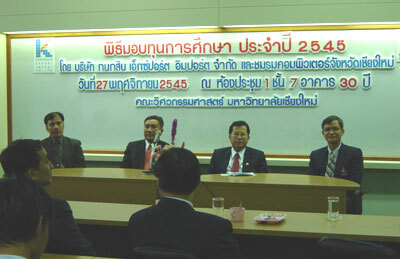 Sumitr Punyakanok (second from left), the managing director of Kanoksin Import Export Company Limited, alongside Prof. Dr. Amnaj Eusook, the deputy rector of Chiang Mai University (second from right). Most recently, Kanoksin Import Export Company represented by Sumitr Punyakanok, the managing director gave scholarships to 5 students from the Faculty of Science and another 5 students from the Faculty of Engineering at Chiang Mai University. The students were given 10,000 baht each on November 27 this year at the 30 year anniversary building, Faculty of Engineering. The students granted scholarships await the ceremony. The Science students who received the scholarships were Prathom Chumyen, Abhiradee Sangthong, Jamlong Khamphachua, Pornpimol Aomkhan, and Bhumintra Su- tawong and the engineering students were Benjawan Wongwan, Prawit Chaiwong, Worakorn Chaichakan, Arnon Niltit, and Saran Yimsricharoenkij. The Ministry of Education’s child development project requires computer equipment for schools in remote areas. Lamphun Technical College is asking for computers, new or old, and computer equipment such as printers and scanners for the rural schools. Cash donations are also accepted as this can be used for computer repair or to buy new equipment. Anyone interested in donating can receive additional information at the information center, Ministry of Education, every Technical College, the Institute of Rajamangala Technology, and Rajabhat Institutes. People in Lamphun can contact Lamphun Technical College, 053 561 029 ext. 101. “Who Owns Women’s Bodies?” (WOWB) traveling art exhibition of more than 30 artworks by top artists from the Philippines is surely getting people talking. Reaching out to a broad public to spark discussion and debate on human sexuality and reproductive rights, WOWB encourages reflection on personal issues that are seldom dealt with in art. This exhibition is organized by the Creative Collective Center, Inc. a non-government group which harnesses art and media for popular education, in cooperation with the Ford Foundation. WOWB has traveled to seven places in the Philippines. It showed in Chulalongkorn University Art Center during June 2002 and opened in Chiang Mai University Art Museum on Dec. 6, and runs until December 31.